How to set up a WordPress blog? I’ve been working as a virtual assistant since 2009 and part of my job is to set up a blog. I’ve worked with clients from the US, UK, Australia, Canada, and Israel. Two years ago, a client from Australia asked me which is the best web hosting for a business website. Lucky to have a web developer friend so I asked her for an advice and she recommended Hosting24. Since I was using my client’s website, switching from their old hosting provider to a new provider Hosting24, I got the chance to talk to their customer service. The Hosting24 chat support was quick to answer my queries. They have 24/7 customer chat support. My job is an hourly task so I wasn’t wasting my time waiting for a slow response. I gave all the details about Hosting24 and let them decide to purchase or not. My client paid the WordPress hosting plan for a year with Hosting24, gave me the login details. Getting back to Hosting24 chat support, he helped with the migration of my client’s website to their platform. It was really quick without breaking a sweat. With that personal experience using a client’s website, I was really confident to have them as my web host provider for my travel blog since 2016. I’ve used the free blogging platforms like Blogger.com, Tumblr.com, and WordPress.com. For my travel blog, I used the WordPress.com and bought my domain through GoDaddy. I wasn’t earning with my travel blog before as I had it in 2013. Got a decent traffic but I had no plan to earn money from blogging until my mentor was telling me I need to switch to a self-hosting WordPress site. Somehow, it was time to level up my blog using the skills I’ve learned from my clients. Indeed, this travel blog serves as my online portfolio ever since. To pay for hosting, you need a credit card or debit card. Spend 30 minutes to an hour to set up the blog and everything. On how to create a blog, you need to choose your niche. Well, I have a personal blog, a travel blog, and a photography blog. But so far, I am more updated on my travel blog. So, it’s really up to you on which niche you are happy to blog about. It can be technology, food, money or investments, and so on. A domain name is also called a URL, your address on the web, which is very important to have on your blog. I chose www.itravelrox.com which is all about me traveling. It should be ‘I Travel Rocks’ and just switch Rocks to Rox. Most of the time, I associate my domain name with Rox. Again, I actually got my domain name through GoDaddy but you can do everything with Hosting24 from registering a domain name to hosting. With this, you can make your own blog. The images being shown are the purchasing area looks like. Again, if you don’t have an existing domain, Hosting24 will give you one for free. Hosting24 transferred everything for FREE. Easy peasy as I have an existing domain name and website. Please make sure to review everything and always seek help from the chat support when confused. You can see a different price range from $2.15 to $3.99 per month and it depends whether you want a year, 2 years, 3 years or 4 years. The more you commit, the more you get a discount. You can choose 12 months though. If you already have checked out and completed the registration, you will get a confirmation email with all the information you need. Hosting24 will send you information on how to login through CPanel. This is where you need to install your WordPress site in just a few clicks. Since I am really forgetful, I always ask the assistance of Hosting24 on what to do next. What I really love about Hosting24 is they really help you a lot and provide you some links or tutorials on how to install WordPress on your own. This is the fun part as I have the freedom now to choose a WordPress Theme. For my travel blog, I am using a WordPress Free Theme from ThemeIsle. On the left side, go to Appearance > Themes. Click the ‘Install themes’ and followed by ‘Upload’ link. Click ‘Choose File’ then select the zipped folder of the theme you like. I create a logo using Adobe Photoshop. You can also use Canva. Find a designer to create your logo using Fiverr. If you need help with a creating a logo, you can contact me for a fee. WordPress SEO by Yoast – this is an SEO plugin for WordPress that helps you to optimize your page and provides you a definitive SEO guide. Google Analytics by Yoast – this allows you to track the overall traffic of your blog, sources, tracking the pageviews and outbound links. Jetpack by WordPress.com – a WordPress plugin full of awesomeness to supercharge your very own self-hosted WP site. I hope this guide helps you on how to set up WordPress blog with Hosting24. Why do I recommend Hosting24 for your Web Hosting Solution? Hosting24 for blogging and business website. With my personal experience using a client’s website, I am totally satisfied with how they handle my queries. I personally recommend this company to anyone. 24/7 Dedicated Customer Support Team. Although I am tinkering with my blog in the middle of the night here in the Philippines, the customer support team is 24/7 online. They really check my website and help me solved my problem. When I have no idea about a technical problem, they will share some tutorials for me to follow and figure it on my own. Reliable and Great Pricing. iTravelRox.com is now an affiliate partner of Hosting24. To be honest, I’ve never heard or read them from any bloggers. I know a lot of bloggers recommend the usual hosting provider but I’ve heard some negative feedback. Since I started to revamp my blog in 2016, I never had any bad experience with this company. To add, I am using another hosting provider just to park my other domain name for a while, the website is not active with no content. I just don’t like the customer service as it will take time for them to respond. Soon, I will upgrade my Hosting24 subscription to unlimited websites. Free Domain. You’ll get a free domain with Hosting24. But if you have an existing website, Hosting24 can easily transfer it to you. Money Back Guarantee. I was working on another client’s website but there was a mistake on the domain name I purchased. They actually changed their plan on changing the name so Hosting24 was nice enough to let me cancel. If you need assistance on How to Set Up a WordPress Blog, don’t hesitate to contact me. I can be your Virtual Assistant. This entry was posted in Work and tagged how to create a blog, how to set up a wordpress blog, how to setup a wordpress blog, how to setup a wordpress site, how to start a blog, how to start your own blog, make your own blog, setting up a wordpress site. Bookmark the permalink. 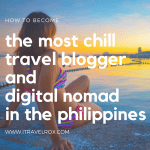 ← Part 1: How Can a Poor Filipina Afford to Travel?